Resource and economic map of Brazil at the height of the Rubber Boom. A fascinating large format 1911 thematic map of Brazil illustrating natural and economic resources at the height of the Rubber Boom (1879 - 1912). The map was prepared by the civil engineer Alvaro José Rodrigues for the Brazil Ministério da Agricultura. The map coves all of Brazil in impressive detail with various natural and farmed resources indicated, including sugar, cotton, tobacco, horses, minerals, fish, coffee, goats, résines (rubber), diamonds, phosphorus, medicinal plants, and more. Charts in the lower left quadrant illustrate export production in 1908 and 1909, where the United States, Germany, and Great Britain, the world's largest auto producers at the time, receive the bulk of the imports. The Amazon Rubber Boom at its height is illustrated on this map, which not only identifies rubber regions, but also offers a detailed delineation of villages and communities in the farthest reaches of the Amazon. The advent of the Industrial Revolution and the rise of the automobile created an insatiable rubber demand in America and Europe. Rubber trees produce a natural latex coveted by rubber and tire producers all over the world. At the time, these trees were not cultivated and grew naturally only deep in the Amazon rainforest where latex collection was a dangerous and labor-intensive process. Nonetheless, the persistent need for rubber and the harsh demands of the environment which produced it, led to the rise of rubber barons defined by fast fortunes, horrific cruelty, and outlandish excess. Tales of rubber barons bringing European opera troupes and ballet companies deep in to the rainforest, building personal menageries of exotic animals, and other extravagances, were commonplace during the height of the boom. So too were tales of their atrocities, specifically the enslavement and murder of thousands of indigenous Amazonian tribespeople. But the rubber barons were not without competition. Around 1912, British investors created vast plantations in their East India colonies, particularly Malaysia and Borneo, which were able to produce latex more efficiently, leading to a collapse in the global rubber market. As quickly as the rubber boom came, it also vanished, and along with it the fortunes it created. This map is well represented in various institutional collections but is rare to the market. It was prepared by the Brazilian civil engineer Alvaro José Rodrigues for the Ministre de L'Agriculture. 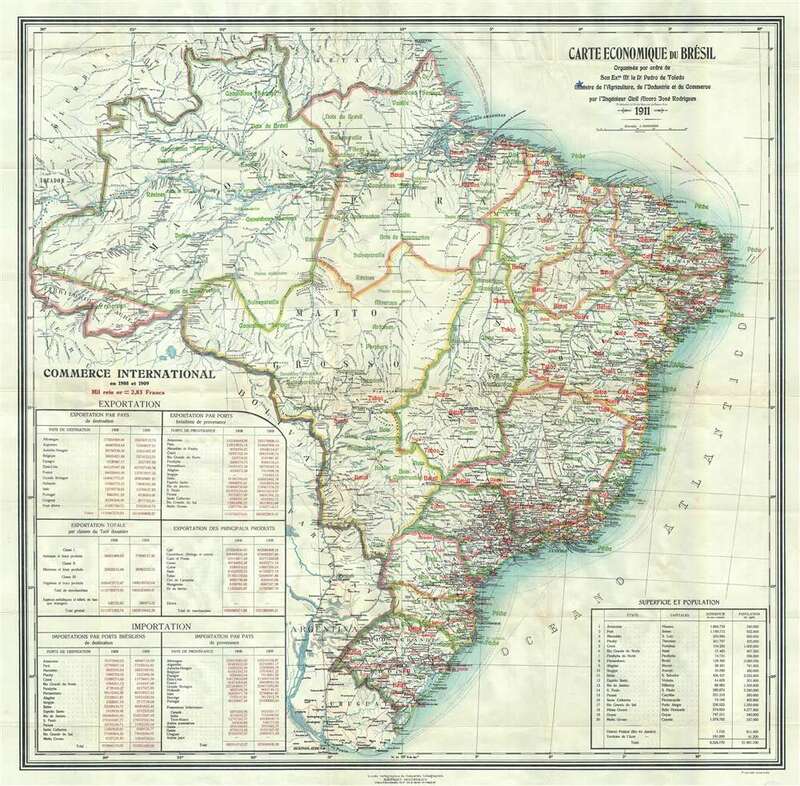 The map was printed in Brazil by Hartmann-Reichenbach. Very good. Minor verso repairs to several small tears. OCLC 18301848. Boston Public Library, Leventhal Center, G5401.G1 1911 .R63.